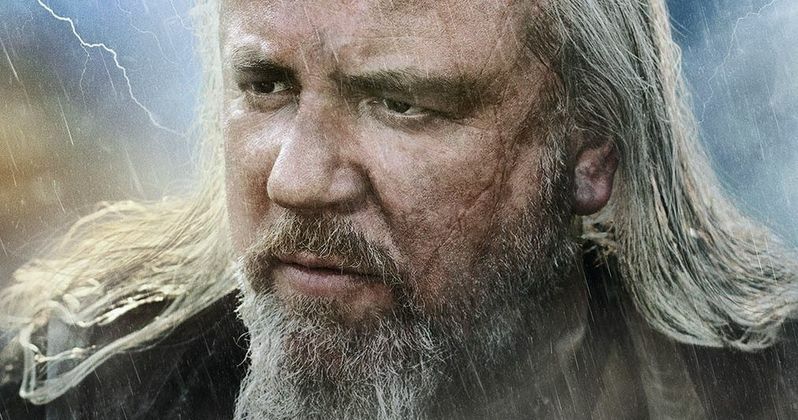 Paramount Pictures is introducing fans to the main stars of Noah with a series of character posters. Today's one-sheets feature Ray Winstone as the villainous Tubal Cain, and Logan Lerman as Ham, the son of Noah (Russell Crowe) and Naameh (Jennifer Connelly), both of whom were featured on yesterday's posters. Check out these images below, then read on for more details about director Darren Aronofsky's battles with Paramount over test screening reactions, the confirmed run time and how he hopes the audience reacts to this biblical adventure. The Hollywood Reporter lays out new details about how director Darren Aronofsky clashed with the studio over the $125 million movie Noah, which is by far his most expensive movie ever, eclipsing the $35 million budget for his 2006 film The Fountain. The studio was reportedly worried about how audiences would respond to this biblical adventure, insisting on holding test screenings while post-production work was still in progress. Paramount recruited a number of Christian viewers, which they had hoped would be the biggest fans of the movie. They questioned the film's adherence to the Bible and reacted negatively to Russell Crowe's dark portrayal of Noah, who, in one scene, gets drunk and considers taking measures to wipe out all of humanity. The studio screened at least a half-dozen different cuts of the movie, in an attempt to woo the Christian audience. When the director was asked about the test screenings which he vehemently objected to, the filmmaker had this to say. "I was upset -- of course. No one's ever done that to me. There was a rough patch. I imagine if I made comedies and horror films, it would be helpful. In dramas, it's very, very hard to do. I've never been open to it." The studio reached out to a number of Christian organizations, including U.S. Christian conferences, Catalyst, the Global Leadership Conference, Women of Faith: Believe God Can Do Anything, and Hillsong, a Pentecostal church based in Australia. Ben Field, the church's head of film and television, attended a January screening of the film, and had this to say. "If you're expecting it to be word for word from the Bible, you're in for a shock. There can be an opportunity for Christians to take offense. [But] we were pretty excited that a studio like Paramount would invest in a Bible-themed movie." While test audiences had a number of different issues with the movie, including clarification that Logan Lerman and Emma Watson's characters are married, there were others that were hard to address. The studio eventually went with Darren Aronofsky's version, which now has a locked run time of 2 hours and 12 minutes. "I'm a great closer. I've never reshot a frame, and I think that's very odd on big-budget movies. We're meticulous. We come from independent film, with limited resources. They tried what they wanted to try, and eventually they came back. My version of the film hasn't been tested ... It's what we wrote and what was greenlighted." The director, who co-wrote the script with Ari Handel, talked about honoring the story laid out in the Bible. "I had no problem completely honoring and respecting everything in the Bible and accepting it as truth. Of course, my production designer [Mark Friedberg] had a million ideas of what it could look like, but I said, 'No, the measurements are right there.' We wanted to smash expectations of who Noah is. The first thing I told Russell is, 'I will never shoot you on a houseboat with two giraffes behind you.' ... You're going to see Russell Crowe as a superhero, a guy who has this incredibly difficult challenge put in front of him and has to overcome it." When asked about what he wants fans to take away from Noah, the director had this to say. "For people who are very literal-minded, it would be great to communicate that the themes of the film are very much in line with the themes of the Bible - ideas about hope, second chances and family. If they allow that, they're going to have an incredible experience with the movie. If they don't allow it, it's theirs to lose."